Good morning! We are back with day 3 of hearings for the federal inquiry into missing and murdered Indigenous women and girls in Iqaluit. This morning, we'll see the end of testimony from Dr. Janet Smylie, a Cree-Metis physician and leader in the field of Indigenous health and wellbeing. We're just getting started with the opening of the day's events. Cross examination will begin earlier than usual, at 8:30, so Dr. Smylie can make her flight this afternoon. Elder Mika Angnakak, from the community of Pangnirtung, lights the qulliq to begin today's hearing. 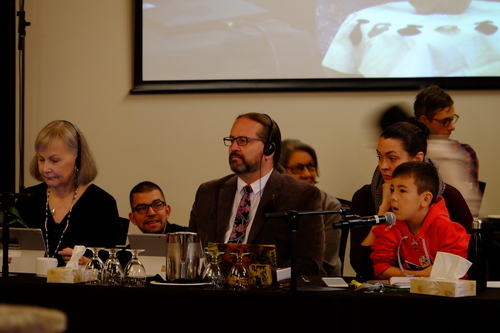 The commissioners watch on as Angnakak speaks in Inuktitut. Qajaq Robinson, who is from Nunavut, is sitting with her son. Cross-examination of Dr. Smylie is set to continue. Erica Beaudin of Regina Treaty Status Indian Services will ask the first questions of the day. Dr. Smylie, on left, is wearing traditional dress today. Beaudin's first question is about storytelling's relation to blood memory. Smylie: "When I think about blood memory, I think about the knowledge of my ancestors, and their knowledge, and their relationships with all living things. My understanding is how in this lifetime, I can have a memory of something... and it's coming from my ancestors." She then says her understanding is "storytelling is a medicine that can trigger blood memory." "If we're trying to come up with solutions, one of the solutions... is our ancestors can always be with us. And a story can help us remember." Beaudin's next question is on the connection of traditional foods in utero to blood memory. Smylie: "That's an area where I'm still learning... but I think that when we eat traditional foods, it's the same thing as sitting on a piece of land where our ancestors have been." In her medical training, she says, she would only break the food down into physical parts. But "eating together is a ceremony... and we have a sacred covenant with the animals and the plants. So when we eat traditional foods, it nourishes not only our physical body, which is attuned to our traditional foods... but it links us to that blood memory, that sacred covenant." Beaudin says that she's been told by her grandmothers that prior to contact her people had birth control measures, but this changed when institutions took control of Indigenous people. Smylie says she has heard as well about birth control plant medicine, and the teaching was "only as many as you could carry." She speaks about creating safe relationships in the home today, educating people that bodies are sacred and people have the right to decision making around reproductive health and sexual activity. She says there are protocols within the families, but that's hard, due to dehumanizing due to colonization. She says the practice of Indigenous midwifery is a hopeful one. "Indigenous midwives are leaders in community and can support us as adults and grandparents. If we haven't experienced sexual violence in our personal lives, certainly we see it in the media still... so I think Indigenous midwives can support environment and conversations around recovering in all of our different ways." "We have elders in our community with knowledge... we have built in ways to promote knowledge and respect for knowledge and sexuality of women." Beaudin's questioning has ended. Commission counsel Christa Big Canoe is making a clarification to the parties with standing. She's telling them that this is a non-adversarial hearing, and that the parties' role is to contribute to the inquiry in the best interest of the public - they can aim to pull up new information, and not just challenge the witness. Beaudin, like multiple parties yesterday, have said it was difficult to cross-examine Smylie because they support her work and aren't sure how to challenge her. Melissa Cernigoy from the Congress of the Aboriginal Peoples is next to question Smylie. She asks Smylie about her counting of Indigenous people in urban centres. Smylie explains that census data uses household counts and relies on long forms, which doesn't often accurately depict the Indigenous population. "We don't traditionally live in cities... we kind of get a second rate counting from these systems. There's quite a lot of pressure from the federal government to not admit there's problems, because it makes them look bad." 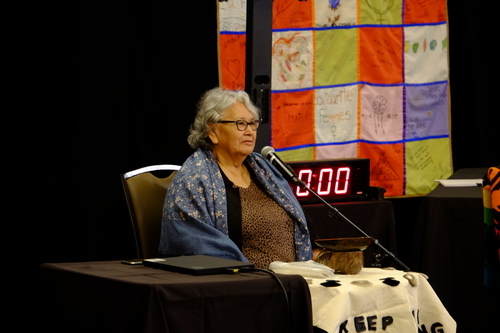 Smylie says that if Indigenous people can't be counted, then often the government will act as if those are counted are the only ones who lives there. She says she is pushing to allow Indigenous people to be in charge of their counts. "According to our best estimates, we think the census is actually undercounting First Nations, Inuit, and Metis people by a factor of 2 [in cities]." This has a negative impact in health outcomes, she says. Counts for disease in communities are even worse than census counts, because "we don't ask. There's no questions in health services about that." She clarifies that there is a stark contrast in rural areas, many of which have very strong internal structures to keep track of their membership. "The big problem is we don't have a reliable way of being counted in [in cities]." She talks about the sash she's wearing. "It's a bit controversial... traditionally women didn't wear sashes. But it's important because traditionally we would use the sashes to be counted in as Metis people." Next question is on how many people go to the cities for education and health services. Smylie says that they are working on these numbers with their Our Health Counts project. "What we have found is that a lot of people are moving to cities," she says. Points out that in their Hamilton count, 60% of people had moved in the last 3 to 5 years. She talks about the concept of "churning," or people moving back and forth from the city to reserve. But what they've found is that there is a "significant" number of Indigenous people moving between cities or within cities. She suspects this is because of the difficulty in finding affordable housing. This also leads to undercounting in the census, because it is biased towards people stable in the home. "The people unlikely to do the census are those with unmet needs. That's a sampling bias." Next question is on disruptors, in particular the lack of Indigenous ways of knowing in federal health policies. Smylie is asked to provide examples. The first one is on forcing Indigenous people on reserve to leave their communities to give birth. "This conceptualization of birth as a time of risk, a dangerous time... and an undervaluing of the importance of birth as a way of strengthening Wahkohtowin." Wahkohtowin, a Cree word, means "everything is connected," and represents ties to family, community, and land. She says that culture is often lost in the shuffle when focusing entirely on the health of the family. "You can have both." 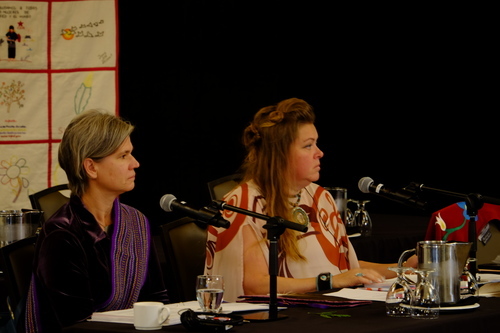 Sarah Beamish, from the Council of Independent First Nations, is next to cross examine Smylie. Beamish's first line of questioning is regarding "racial battle fatigue," and how it is a form of intergenerational trauma. Smylie says that studies are underway to explore long term physical and mental health impacts: "I think we're still trying to show it in a way that outside of Indigenous communities it would be understood." The next question is on if the Canadian medical system is equipped to deal with this issue. Smylie: "I think there's bright patches." She points to First Nations, Metis, and Inuit run clinics, and models where non-Indigenous clinics have Indigenous advisory groups. She asks about Smylie's use of the word "brave and bold" in evaluating strategies to fight this: "did you use those words because you expected to find problems in your studies?" Smylie says yes. She speaks about how everybody, including herself, falls short on creating a respectful environment sometimes due to a lack of knowledge, and that can lead to "suboptimal medical care." "It's hard to admit that you're making errors, instead of hiding them because you're ashamed. I think it takes honesty and courage to admit that you don't know everything. Racism exists, it exists in me. Every human being is capable of it. But in hospital systems we like to pretend it doesn't exist." She says that many people have an easier time speaking about systemic racism - blaming the system - rather than confronting their own biases. The next question is about Indigenous people accessing education in health science. Smylie points out positive models like UBC, where there is a separate application process for Indigenous students, but says that there needs to be a change in structures to increase barriers to access. She talks about having another Indigenous woman join her faculty: "it's good when the numbers are low, because when we get a new one it doubles." Draws a laugh from the room. Beamish asks Smylie to speak about PTSD in Indigenous communities, and the link to violence. "I think what I would call it is complex trauma," Smylie says, pointing out that PTSD screening tools are developed for soldiers that went to a war or two, "but we've been in a war for a couple hundred years." "If we think 1 in 3 Indigenous people living in Hamilton has complex trauma... the positive thing, in a way, is that we have experience dealing with it," she says. "Storytelling, there's ceremonies too. But also in mainstream medicine, there's emerging treatments for trauma that are moving very quickly." So quickly in fact, that trauma may not be a medical diagnosis in 20 years. She says one of the most promising ones is based on storytelling. "It takes bravery to address [trauma] and to name it, but we can deal with it." Some of these techniques were developed in refugee camps, she says, and you can train local people to use them. "What bothers me the most is that there is a total gap in access to treatment for trauma." She points at Toronto. Her counts show 70 to 80 thousand Indigenous people, with 1 in 3 having acute trauma, but she can't find a therapist to refer to: "that's just outrageous." Final question from Beamish is about deciding who's Indigenous, and how the denial of one's Indigeneity can be a determinant of one's health. Smylie: "I think the denial of Indigeneity is a form of genocide." Talks about how settlers made those definitions, and how she's constantly questioned by both non-Indigenous and Indigenous people. "If you think of another ethnic group in this country, it would be hard to imagine it to be acceptable for the state to be legislating their identity, and for other people, to be sharing non-community proofs of their identity." That's the end of Beamish's questions. The Northwest Territories Native Women's Association, represented by Jessi Casebeer, is up next. Casebeer's first question is about a "hand up" approach. Smylie: "I think as Indigenous people there's this stereotype we need a hand out. But often we actually just need a hand up." She speaks about addiction as a form of self-medication from colonial violence, and supporting mental health in communities. Historically the federal system had people to provide services in communities, but they were poorly suppported. Speaks about faults in programs being faulty because they are focused on non-Indigenous mental health - instead, we should support people in communities to provide these supports. "These people know best." Casebeer asks about the hands up approach in a Northern context. Smylie goes back to Indigenous midwifery, and the program in Puvurnituq. Family doctors worked with the community to get a training program going.